Deep Space Station 14 is hidden inside a remote federally owned swath of the Mojave known as Goldstone, like a setting in a scifi movie. 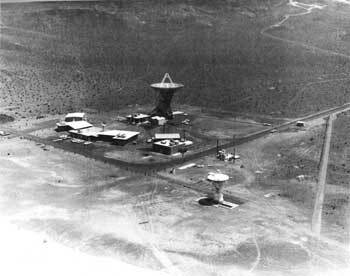 The antenna, little known outside JPL and NASA's Washington, D.C., headquarters, is informally dubbed the "Mars Antenna" because its initial task, in 1966, was to track a spacecraft after it flew past Mars . Its dominant feature is its parabolic dish, which stretches nearly the length of a football field and weighs, struts and radio equipment included, nearly 2,000 tons tracks asteroids, rovers on distant planets, and probes rocketing through space as far as 11 billion miles away. 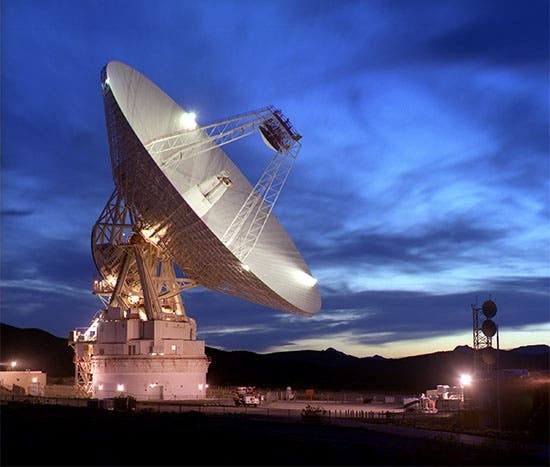 Although there are larger antenna, none match Deep Space Station 14 for its combination of communications power and historical significance, said Cornell astronomy professor Steven Squyres, lead scientific investigator for the Mars Rover project in an interview with the LA Times. If the dish — scanning space with the help of a pair of newer, nearly identical antennas in Spain and Australia — didn't exist, he said, "the rovers we send into space just might as well not even be there. We wouldn't even be able to try." As the decades have passed, however, the 44-year-old edifice is in need of repairs. This past March, in anticipation of a series of spacecraft launches over the next five years that could lead to a manned flight to Mars, a major remodeling job began, led by JPL and paid for by NASA, on the 80-foot-wide ring of steel and cement known as the hydrostatic bearing. It provides a foundation for the dish, allowing it to spin on a horizontal plane, rotating by sliding on a thin coat of oil constantly pumped on the bearing's surface. NASA needs the antenna to be operational by Nov. 1, in time to communicate with an orbiter during its flyby of the comet Hartley 2, which will be between Earth and Mars. The job must be finished without changing the height of the 235-foot structure by more than one-eighth of an inch, a requirement made difficult by constant desert winds and soaring temperatures that expand the antenna's metal. The antenna was conceived at the beginning of the space race because NASA needed one more powerful, accurate and nimble than it had ever built. Goldstone — 52 square miles of desert that is home to 11 smaller space antennas — was chosen because it was so far from cities that the airspace wasn't cluttered with competing radio signals that can wreak havoc on transmissions to space. Since its first year, Deep Space Station 14 has shepherded, at least partly, every NASA spacecraft that has traveled far past the moon. That includes the Galileo mission to Jupiter, the Cassini to Saturn, the Mariner missions to Mars and the Voyagers 1 and 2, which are at the edge of the solar system. The antenna also played a role in several famed manned space flights. In 1969, after the first manned mission landed on the moon, it captured Neil Armstrong saying: "That's one small step for man, one giant leap for mankind." In 1970, when the Apollo 13 moon mission had to be aborted after an on-board explosion, vital communication went through the Deep Space Station 14. After a risky return through the Earth's atmosphere, Apollo 13 made it safely home. "They were operating on such low power with their radio transmitter that the only station with enough sensitivity to be able to carry the voice back to Houston was the Mars antenna," said Douglas Mudgway, a former JPL operations manager who has written a pair of books on the structure. Plans are underway for a system using much smaller dishes networked in clusters that will eventually replace the antenna.